The nice thing about spending the latter part of winter down south is that one experiences spring twice in one year - once at the beginning of March in Texas and the second at the end of April here in Saskatchewan. The greening of grass and the blossoming of flowers is much the same in both places, but the migration of birds is not. In the spring, in Saskatchewan, we experience the loss of a few winter birds like the Bohemian Waxwing and Pine Grosbeak that leave for the north, but at the same time we are swamped with an influx of summer residents of every description and with quite a few transients such as the White Crowned and White Throated Sparrows thrown in for good measure. In Texas things are just the reverse. There, the large migration is of winter birds, especially waterfowl and shore birds, that head north in the spring leaving the southern wetlands somewhat barren for the summer. The opposite occurs in the fall. On the other hand, they do have many more transients than we do, especially warblers, that are passing through on their way to and from the north to the tropics. However, there are very few summer residents in Texas. One notable example is the Scissor Tailed Flycatcher that spends the winter in the tropics and breeds in the southern US. The Fulvous and Black Bellied Whistling Ducks used to head for Mexico for the winter and show up in Texas in March, but in the last few years even they have been observed all year round. In summary, the large influx of migrating birds in Texas occurs in the fall while ours occurs in the spring. At the moment some of our summer residents such as crows, robins and Mourning Doves are already here but the bulk is yet to come. With the prediction of much milder weather for the next little while, the transients should be arriving in full force in the first two weeks of May and then lingering for two or three weeks before heading north. Juncos and Fox Sparrows are here already. Transients can be seen both spring and fall, but spring is better because the spring birds are in their bright breeding plumage and easier to identify. This week I decided to cover a transient that is a member of the family of warblers but behaves more like a nuthatch than any warbler. 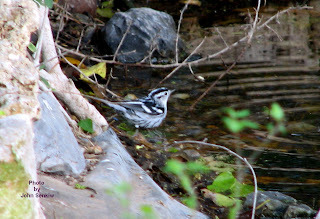 This warbler, aptly named the Black and White Warbler, is an uncommon but regular visitor in the backyards of towns like Foam Lake. All warblers have powerful legs and feet and can hang upside down when feeding but none do to the extent that the Black and White does. When feeding it spends most of its time creeping head first up and down the trunks and larger branches of trees looking for insects. Its colour patterns are such that, once seen, the bird cannot be mistaken for anything else. 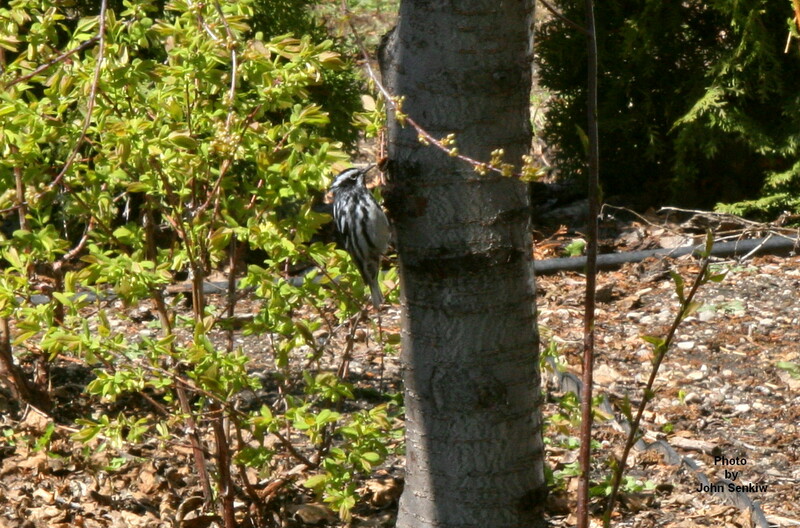 No other bird is striped in such bold contrasting black and white stripes running the full length of its body. The males and females are very similar with the male having more black on the face. The Black-throated Grey and Black Polled Warblers look somewhat similar but are not nearly as "stripy". 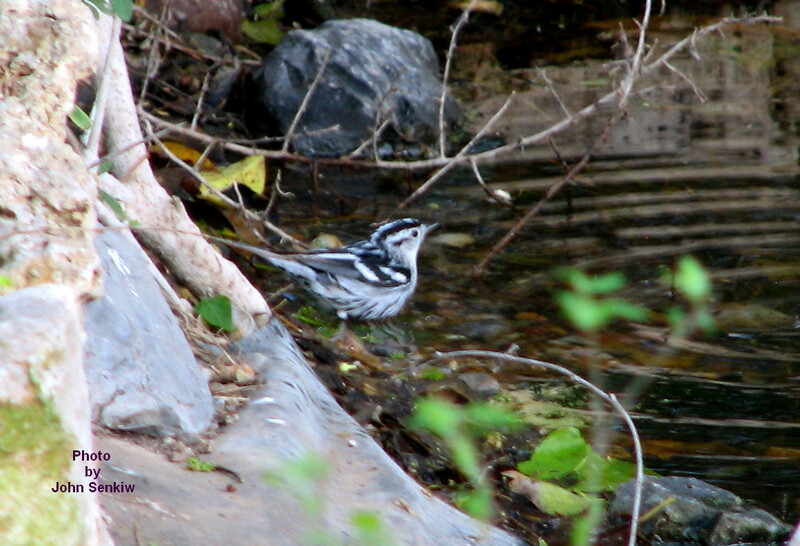 I have taken pictures of the Black and White Warbler in our backyard but they did not turnout well so I could not use them. However, I did manage to get a good shot of a female taking a bath in a water feature in Texas and this is the one that is included with this article. With any luck this bird might show up in somebody's backyard this spring. I finally got a good shot of a male, and, in our backyard. Our feeders had been busy until a Northern Shrike showed up in our backyard on at least two different days (the times that we saw it). On its second visit the shrike managed to surprise a male House Sparrow at the sunflower feeder. We thought the sparrow was doomed but it was smart enough to realize that flight was too dangerous so it just stayed absolutely motionless until the shrike left. For about fifteen minutes or so we watched the shrike looking for something to eat and, only three or four metres away, the sparrow trying to look invisible. Fortunately for the sparrow it blended in with the feeder so well that the shrike did not notice it. The shrike then flew off to our neighbour's place, probably to visit her feeders, while the sparrow made a quick getaway. 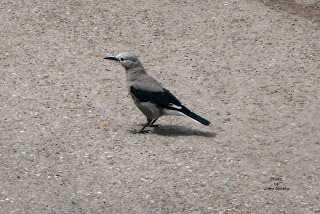 Seeing the shrike reminded me of another similarly coloured, but unrelated, bird of the Rocky Mountains - the Clark's Nutcracker. 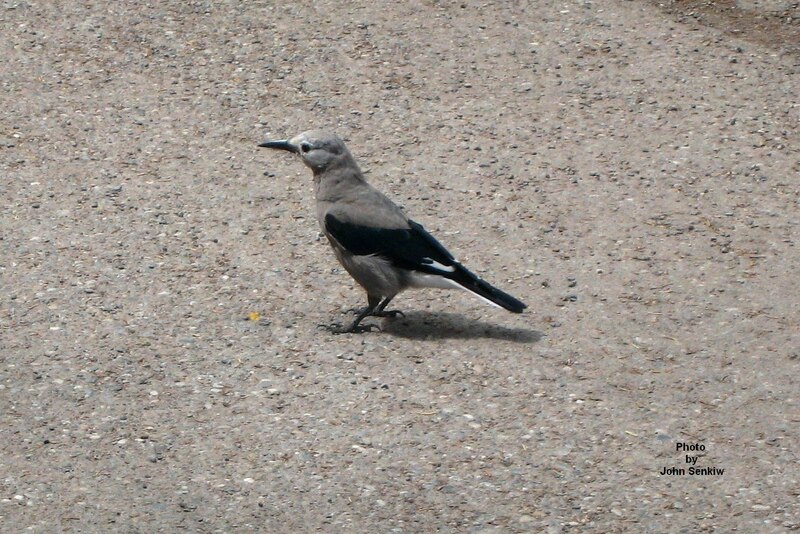 Like the Northern Shrike the robin sized Clark's Nutcracker is a grey bird with black wings and tail marked with white. The markings are slightly different but the easiest way to tell them apart is by the facial markings. The shrike has a racoon-like black mask while the nutcracker has a plain grey face. Other than colouration the birds are completely different. For starters, the nutcracker belongs to the corvid (crow) family while the shrike is in a family of its own (see Article No. 26). Like all corvids the Clark's Nutcracker likes to scavenge and benefits from human presence. There are many people from around here who, from time to time, visit the Rocky Mountains, especially Banff and Jasper Parks. In these places the Clark's Nutcracker is plentiful, tame and always on the lookout for some tasty morsel that may be offered or carelessly dropped. Its primary food sources are the seeds of pine trees with Pinyon Pine (yes, the expensive stuff that we buy in stores) being especially favoured. If there is a shortage of pine seeds (pine nuts) the nutcracker, like its cousin the Blue Jay, chisels away with its bill at hazel nuts exposing the meat inside which it then eats. In the fall the nutcracker carries seeds in its cheek pouches and stores them in many different places to be used over winter when food is scarce. It stores far more than it needs thus allowing for losses to theft by other animals and to simple forgetfulness. The latter gives rise to new trees sprouting. Its method of eating nuts gave it the name of nutcracker. Since there is only one nutcracker in North America this one word name should have sufficed, but a first name of "Clark's" was added in honour of William Clark of the famed Lewis and Clark expedition that took place in the US in the early 1850s. Sometimes locals refer to it as Clark's Crow. This week's picture was taken at Banff National Park in the summer of 2009. Since Cark's Nutcrackers are not migratory they can be seen any time of the year although they do drop to lower elevations for the winter. For anybody who has been to Europe Clark's Nutcrackers are very similar in many respects to the all-black Jackdaws seen in city parks there. We received a call that a Great Horned Owl had landed on the roof of the hotel down town, unfortunately, before we got there it had taken off. Who knows, maybe there will be a next time. FOAM LAKE BIRDING No. 112 The weather in southern California has been cool and quite wet, relatively speaking, but the California spring has arrived and everything is unusually green and lush. On recent bird walks I have spent more time looking at the plant life, especially the flowers, than the birds themselves. Overall, a very pleasant experience. 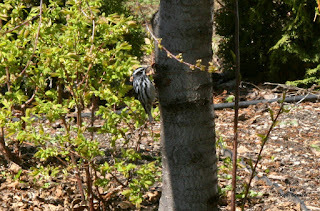 Adding to the experience, a Bewick’s Wren has decided to use a palm tree in the backyard as a stage from which to sing. Every morning at daybreak, not my favourite time of day, the wren bursts into song and continues for a half hour or more repeating the performance intermittently throughout the day. Sleeping with the windows open brings in the song loud and clear. I have heard Bewick’s Wrens before, but never in an urban setting. May the trend continue. This week I want to cover a water bird that, if it occurred in Foam Lake, would easily be mistaken for a Coot. 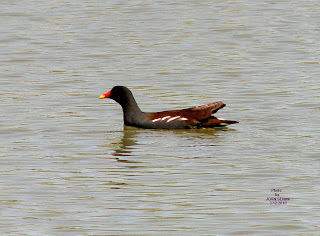 The Common Moorhen (formerly, the Common Gallinule) is found from southern Ontario south to Mexico east of the Mississippi River and from Oregon to Mexico along the west coast. 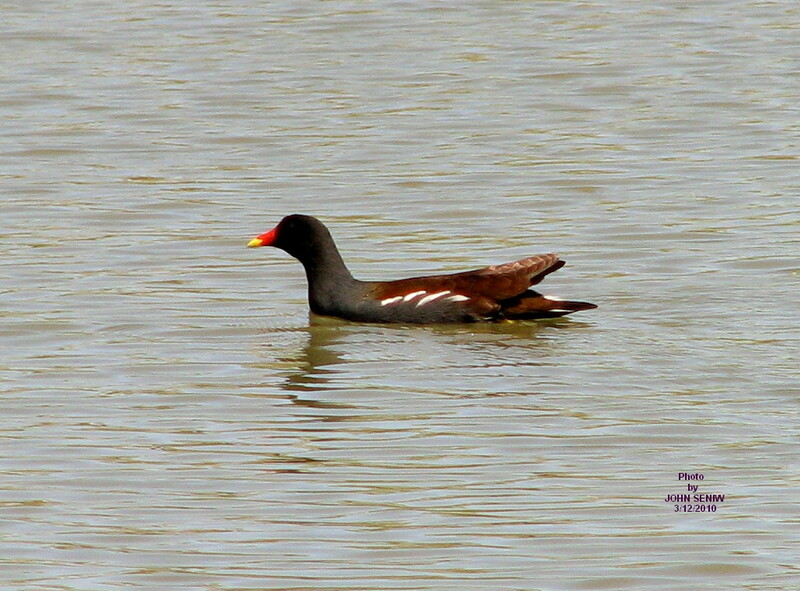 Where waters freeze over the Moorhen migrates to open water, otherwise it is a permanent resident. In size, looks and behavior it is very similar to the Coot, however, there are several small but quite obvious differences that even a beginning birder will be able to utilize. First, the Moorhen’s bill is red with a yellow tip; the Coot’s bill is all white. Second, the Coot’s body is all black; the Moorhen’s body has a heavy jagged white stripe running lengthwise along the wing line. Third, the Moorhen’s body is more slender and trimmer than the Coot’s which are rather chunky. Coots are birds that are often seen in the open whereas the Moorhen is somewhat more secretive spending more time in the rushes. The Moorhen make Coot-like sounds but is not nearly as vocal as the Coot. Any birders visiting in the zones listed above should be looking for Moorhens mixed in with flocks of Coots.